At the Full Parish Council meeting held on Wednesday 3rd January 2018, the Parish Council considered the future of the Former Sunday School building, also known as the Church Rooms, and its associated land in Nanpean. It was agreed that St Stephen in Brannel Parish Council will manage the outside area as a public, free of charge, short stay car-park and, subject to planning, create a second entrance/exit to help with the flow of traffic, especially at school drop off and pick up times. In addition, 2 sets of large wooden solid gates will be installed at the section by the double entrance to Nanpean cemetery so that this area can be closed off for funerals or Council works when required. It was further agreed that a section to the left of the building will be converted into a crib hut for staff working in Nanpean cemetery. In addition, further space will remain under the remit of the Parish Council to be used as a community lounge/room and an additional or future Parish Council office. During the on-line poll, a number of comments were submitted via the Parish Council website. There was a repeating query on the consideration of other offers. To date, the Parish Council has not received any other offers. Members discussed this query at length and it was agreed that, whilst the convenience store had been heavily supported, the opportunity for other offers to be submitted should be given. Therefore, the Parish Council are now asking for any other offers to be put forward to lease the main section of the building. Any offer submitted must be for a community facility and be supported by a full business plan that includes proof of sustainability plus financial backing. Furthermore, the offer will have to cover internal refurbishments, change of use planning fees and utility connection costs. If you are interested in submitting an offer, the information needs to be put in writing to the Clerk by 12 noon on Wednesday 7th February 2018. If you have any queries regarding this matter or wish to view the interior of the building, please contact the Clerk on clerk@ststepheninbrannel-pc.org.uk or 01726823003. The Parish Council are aware that a number of people feel very passionately about the future of the building and are keen to hear everyone’s views. However, any comments that are deemed abusive, threatening or detrimental to person will be passed to the police. Please can you tell me how expressions of interest in Nanpean Church Rooms will be publicised? Not at this time. It will depend on what offers the Parish Council receive, by whom and how much personal information the person/company making the offer is willing to release into the public domain. ?? I thought the purpose of an article in the St. Austell Voice was to invite applications of interest from other people/businesses with different ideas for a potential use for the Church Rooms eg veterinary surgery, gym or whatever. However, the article in the Voice gives a certain impression that a decision has already been made that the building will be used as a conveneinec store, and the Parish Council is only looking for other offers from people to run this store, as opposed to offers of alternative usage. Would someone from the Council please respond to this via this comments section and clarify what the position actually is. Assuming that the article in the Voice is misleading, and the Church Rooms are open to offers of alternative use, please would the Parish Council let us know how they intend to advertise properly to other potential people and businesses. For me, a community facility that will inevitably shut down an existing community facility ie the PO & store next to the pub is not very community minded at all. I have just seen the article in the St Austell Voice and the opening line is incorrect. The Parish Council are asking for offers to lease the building as a community facility. I will contact the newspaper and ask for this to be clarified in their next issue. cannot see that clarification in this weeks paper?? will it be in next weeks then ??? I have been following the ongoing debate on the future use of the Church Rooms and do feel I should offer a different perspective – the Parish Council will now have realised that they hold all the cards. Rather than putting in further grant applications for roof repairs and re-tarmacing etc,, plus onging costs of repairs and maintenance, they could now of course cash in on their investment and sell off the buliding and/or land with restrictive covenants ensuring access is maintained to the cemetery/new entrances/exits are built and any other stipulations they may wish to impose. They could dictate exactly how they want the site to be used and exactly what any finished development will look like by putting these covenants in place prior to a sale. Surely a good use of this building/land would be to create affordable housing / housing asscoiation units – built to exacting specifications. This would enable the Parish Council to have non-negotiable planning permissions put in place, increase the value of the site and realise a good capital return on their investment whilst at the same time ensuring that no more money (via grants or otherwise) need be spent either now or ongoing. The building will require a bottomless pit of money to maintain. Conversion to a convenience store – via either a fully repairing or internal only repairing lease – can only result in either the Parish Council facing hefty future maintenance bills or the leasee facing hefty future maintenance bills – both leading to the building becoming unaffordable or non-commercially viable. I have to agree with Mr. Whyte. The Council have already stated that they had not allocated funds for any substantial repairs to the building. This indicates that any current plans stem from the interest being shown by the ‘local businessman’. They will need to allocate substantial amounts immediately and ongoing – a cost that had not previously been budgeted for. Funding via grants is therefore a very questionable solution – using public money to effectively fund a private enterprise will certainly not go unnoticed. A convenience store is not necessarily a ‘community facility’, even more so if there is to be a personal gain for an individual, partners or company structure. Putting a shelf full of books into such a venture will not qualify it as a library either. Potentially putting other businesses in the village at risk of closure will not assist. The potential loss of the village pub will strengthen any case or challenge. I imagine that there have been no other offers for usage of the Church Rooms. That tells a story in itself. No other companise/individuals/ businesses in the area can calculate a commercial future for the site. Mr. Whyte is correct in saying that the Parish Council should bolster their coffers whilst ensuring that they retain from the site exacty what they want. The best use for this site would be to level the site and create a memorial garden plus parking, or to create a room where funeral services could be held – that is a real community facility. The building is in a state of derepair and will undoubtedly cost major sums of cash now and ongoing in order to maintain it. If the Parish Council do infact intend to raise funds to bring the buliding / car park upto a reasonable standard, then surely the Council should at least give the buliding an opportunity to become a genuine community facility ie trial various clubs and societies, rent the rooms out for functions, meetings etc, just see what the community/Council can themselves establish as a usage for the rooms. This should at least be trialled for 12 months or so rather than just lease the building out to a privately owned business.. If the buildng is leased and personal money has been invested, the only opportunity for a true and genuine community facility will be lost. Why did the Parish Council bother to purchase the building if their intention was only to lease out? A developer could have improved the building in super quick time using only private money rather than utilising various funding options. All that aside from the fact / likelihood of losing the current PO and shop, and maybe even the pub. The Parish Council shoud tke inspiration form the article in todays Cornish Guardian relating to Treverbyn Community Hall. With a little effort, the same could be achieved in Nanpean also – a far better option than allowing yet another convenenience store to be opened. Do not let the Church Rooms become a convenience store ! What a waste of a potentially wonderful building ! And is it really right to use grant sourced money to revitailise a buliding that is then going to be rented to a private individual ?? Surely once this money has been secured for the required repairs, the building should be used for genuine community events and services that relate to its position of being right next to the Cemetery. Really, a store receiving deliveries, customers coming and going etc etc. whilst people attend burials, whilst people lay flowers at the graves of their lost loved ones, whilst people just want to spend some quiet respectful time and grieve – the building is a Church Room, it is located next to the Cemetery. It never was, and never should be even considered as a potential site for an arguably non-required convenience store “servng alcohol, tobacco, parcel collection” etc etc, combined with a few illuminated advertising signs just for effect. Really, have we lost our morals? It woudn’t be progress, it would be a mistake. The shop at the Grenville has now stopped selling newsapers so those who go there to buy a paper, bread and milk will get them elsewhere ( why go to one for newspaper and then back for milk?). The shop will be closed soon if this is the way it is going .and we will not have a shop at all. I love that building but if it’s not used it won’t be there much longer. At least this way it can be maintained and anything could happen in future. Cemeteries have been in the midst of community life for hundreds of years. Churches are very often next or very near to a public house. St Austell for instance, St. Stephens too. People work together. They park in or just outside the pub in St. Stephens for funerals. The Landlady has respect for the church activities and it works pretty well from what I’ve seen. Our morals are not reflected in letting a lovely old building fall down because we can’t do anything that may or may not affect others. Our morals begin when we respect others and hat is down to us not what is inside a building. Personally, I think it is time he project got going if we are not going yo be in the position of losing the bolding for ever. I don’t think that anyone suggested that the building be left to deteiorate. The Parish Council are in the process of sourcing grants to ensure that this does not happen. They purchased the building to ensure that access to the cemetery was maintained. I presume that they do not intend to sell it to a builder/developer. If, and it is a big if, the current store in Nanpean does close, you can hazard a reasonable guess that this has happened due to a lack of custom. If a small shop like that cannot survive, then an oversized one in the Church Rooms has little chance. The point is that the Church Rooms should be used for genuine community activities, not a convenience store. A convenience store at this site will be a pending disaster for all concerned. The Church Rooms need to be established and used rather like a village hall would be utilised. 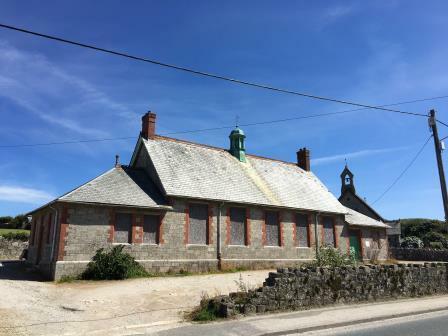 There are countless examples through Cornwall and the rest of th UK where village halls are successfully operated and utilised. Whats the difference here? I agree with the comments made by ‘changed my mind’. The Church Rooms were purchased by the Parish Council in order to preserve access and offer a suitable environment for visitors to the cemetery. Allowing a convenience store to be located here is an awful idea. I do not know what rental income the building may bring in, but whatever that figure is, it will not be worth losing the site in favour of a conveneince store. The Parish council should repair the building to the best of their funding abilities, then hire out the rooms to various clubs. societies etc etc. I appreciate that the residents of Nanpean, including myself, would, in an ideal world, like to have a store, but it is not actually required – there is certainly already plenty of choice by way of other stores in the vicinity (including the proposers current NISA in St. Stepehen) and also supermarkets offering delivery services. It would almost be tragic to place a convenience store on a site that is adjacent the cemetery, and would soon become a ‘bad historical decision’ if it actually went ahead. Mr Batten should reconsider his proposal, if indeed he is as community minded as he makes out. I have just received the Neighbourhood Plan survey and see that one of the questions relates to providing office space/work units etc – what a wonderful idea and what a wondeful way that the Church Rooms could be utilised to benefit residents of the WHOLE Parish area, This is what the Church roooms should be used for, investing in the people that reside in the Parish, this would justify the initial purchase of the builiding by the Council and would also justify the expenditure required to bring the building up to standard. The whole Parish should/would benefit from the building being used as that – a true community facility.for everyone, giving opportunity for many to expand their horizons. What !? allowing another convenience store to open in nanpean is bound to spell disaster for the exisiting shop & PO. The current shop is likely to close I guess, how is that helping anyone? How’s that for supporting the community, not to mention Mr. Phillips who had the decency to put the PO into his premises in the first place. The current store serves its purpose, anything bigger than that simply will not survive in a small village, such as nanpean is. The outcome of allowing another store in nanpean would be the loss of the current one, the possible loss of the pub, and a new store that would not have enough custom to last longer that 12 months, then nothing at all. The Parish Council must be able to forsee this?